We got an technical problem when developing Hololens Vuforia App. Hololens provide a "Live Preview" function when we access to the Windows Device Portal. The "Live Preview" works normally when we are not running Vuforia App. 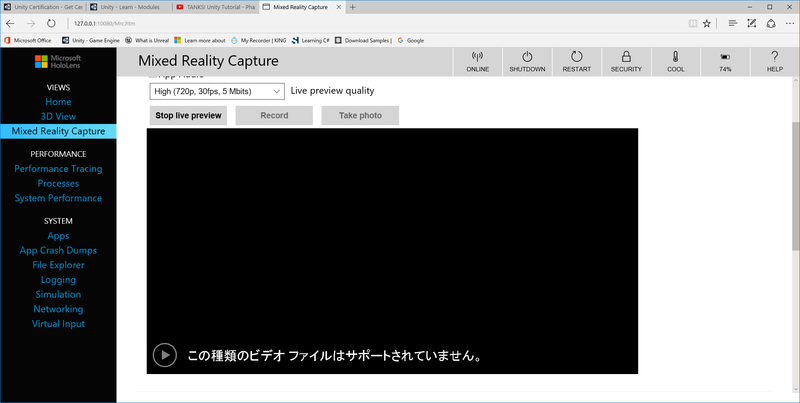 However, Vuforia App seem crash the "Live Preview" function. 2. Wait until the App is initialize and run. Is there any method to solve this problem such that we can share the Hololens screen with others around when running Vuforia App? You can record videos of Vuforia apps running on HoloLens. Note that for this to work, the app running Vuforia must be started *before* you started to record with HL’s MRC. If you start recording first, the video will abruptly stop once Vuforia gets access to the HL camera. You *cannot* do MRC Live preview while a Vuforia app is running in any case. If you try to start Live preview while a Vuforia-based app is running on HL, you will get an error in MRC. If you try to start a Vuforia-based app while Live preview is running, the app will not start. The limitations above are related to real-time camera access for apps running on the HL. In order to guarantee optimal detection and tracking performance, Vuforia is granted sole access to the live camera feed. This is similar to other platforms that we support, such as Android and iOS. The Live preview app requires real-time camera access, so while it is running Vuforia is blocked from accessing the camera - and vice-versa. You can live preview whilst running a Vuforia application on the HL. What I have done in applications I've created is once I am extended tracking I then kill the camera instance. The hologram still appears because the HL takes over and uses extended tracking. Therefore once Vuforia gives up the use of the camera live preview can then take over. You can then also stop live preview and enable the camera instance again whether that be via voice commands, button, etc. 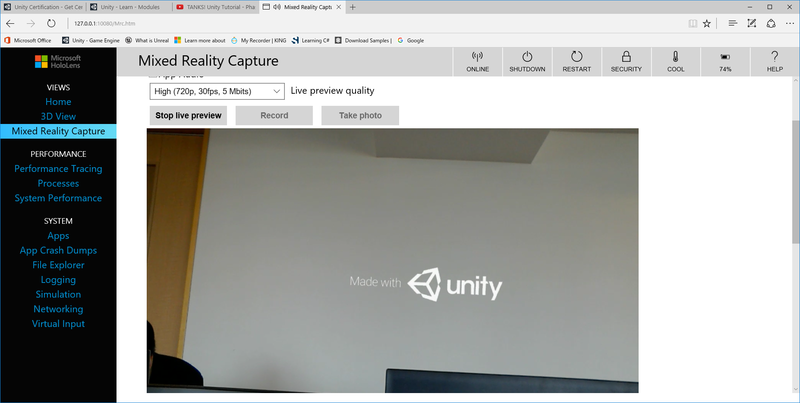 I am having a similar problem with mixed reality capture of a Vuforia app: the recorded video differs to what I see when I'm wearing the HoloLens. My application is very simple. It displays a red model on top of the cylindrical target. When wearing the HoloLens, the red model appears directly on top of the target. In the mixed reality capture, the red model has moved to the side. Has anyone had a similar issue, and found a solution? I got the same issue with me now. I have an app that uses a cylinder as the marker to track an object. The video that i record is different from what i can actually see wearing the hololens. When im wearing it, the real marker and the virtual marker overlap pretty well. However, in the video there is an offset, just like what you showed us in the picture. Did you eventually solve the issue? Or anyone has any idea how this can be solved? The offset that appears in recorded videos has to do with the Stabilization Plane. This link talks about it. Basically, you'll want to enable the "Enable Depth Buffer Sharing" option in the Player settings in Unity. If you have the MixedRealityToolkit in your project and the Stabilization Plane Modifier in your scene you'll want to disable "Set Stabilization Plane" because that will override the Depth Buffer Sharing option.